I realized that yesterday’s post may have given the incorrect impression that you need to go through all sorts of mind bending contortions to get timephased reporting out of Project Online. The reality is that you’d only have to limber up if you wanted to do reporting like I showed yesterday, i.e. a detailed view of all projects and capacity by resource and time. The reporting gets a lot simpler when you’re looking for less data. Moral of the story: simplify the reports to reduce the effort required to create them. This report was pretty easy to develop, but doesn’t have all of the individual projects displayed in the stacked bar chart. To simplify things, I can add that detail as a second chart on the same worksheet using the data feeds we already created. Overall, I’d argue that we don’t lose a whole lot in terms of experience by reducing the information density of the overall dashboard. I’ve read both your last posts and am truly impressed by what you’ve pulled together. I will spend some time to repro in the environment I use for customer POC. 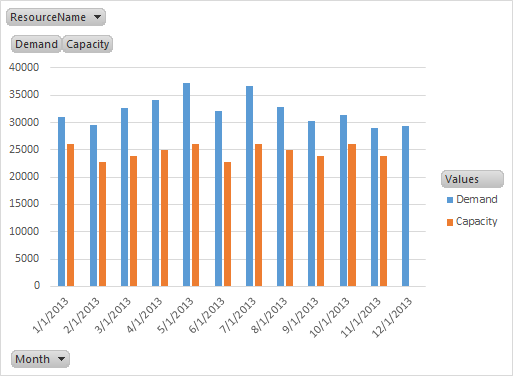 But like you said, I’d be reluctant to use your ‘capacity project’ hack in a production environment. Hence I’d be reluctant to usher customers to Project Online as of now. 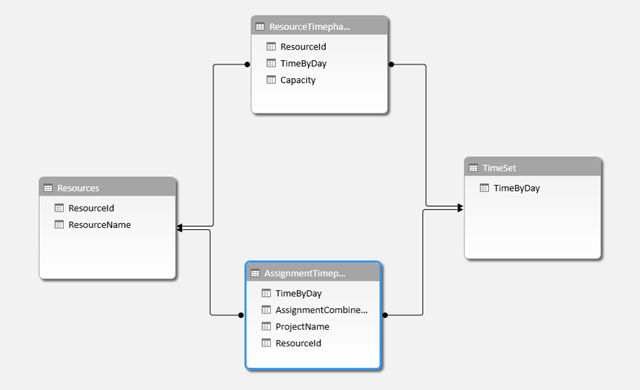 I really believe the product team should create an oData feed that contains both Assignment Timephased Work, Resource Timephased Capacity and include every Project and Resource Enterprise Custom Field (e.g. Project State, Resource Contract Type). Oh, and while we’re at it, Tasks and Assignments should all inherit Project custom field values by default :-). Agreed with you that a single feed including both capacity and work would ease the reporting. I’ll pass it on the next time I chat with the fine folks in Redmond. Thank you for this and your previous post. This is a capability that is sorely lacking from Project Online, and I hope Microsoft uses your example to build a similar capability into their base offering. “Calculation error in measure ‘TimeSet'[Month]: The value for ‘TimeByDay’ cannot be determined. 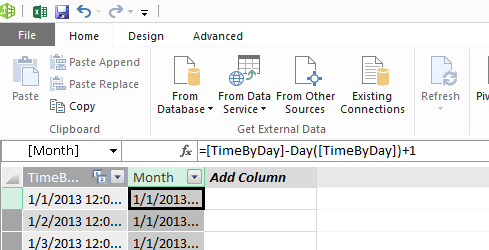 Either ‘TimeByDay’ doesn’t exist, or there is no current row for a column named ‘TimeByDay’.” Can you tell me what I am doing wrong? The other has to do with performance. I created both of the above connections using Project Online and the Contoso sample data, and it took several minutes to refresh each of the datasets. Apparently despite the filters built into the queries, it must walk through every record. Not sure if there was a way around this. Not sure about the first, although I would suspect that maybe you just haven’t named the column correctly? Or are you using a non-US English version of Project Server (as the columns get localized, I believe)? Hi – If you copy\paste from the blog you might get this error because the quotation marks are not valid for use in a formula. I found that if I copied to Notepad first and just replaced the quotes with the Notepad version, it worked fine.